This arresting painting is among the best loved works of Sir John Lavery, one of the finest British artists of his time. The painting was produced in 1919; Lavery was an extremely sought after figure at this time, having been knighted the previous year. He further justified the honour with this beautiful work, which combines stunning use of colour with an expertly composed scene. This was a no less momentous year for Lavery’s subject in this work. Lady Astor, born in Virginia in 1879, became in 1919 the first woman to take up a seat in the House of Commons. This marked the beginning of a long and controversial political career: while she never attained a position of real power, she achieved notoriety for her frequent outspoken stands – perhaps the most famous of these was her questioning of Joseph Stalin, in person, over his brutal treatment of the Russian people. Lady Astor was a keen golf player, and installed a course at her estate in Buckinghamshire. Among her favourite courses was that of the famous North Berwick Golf Club, one of the oldest and most prestigious golfing venues in the world. This is where she is depicted in this painting, driving off from the sixth tee. Between 1919 and 1924, Lavery and his wife frequently visited North Berwick to visit Sir Patrick Ford, who was one of the artist’s staunchest patrons. 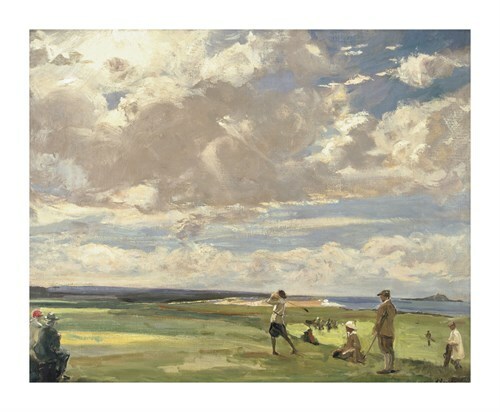 While he was not an exceptionally talented golfer, Lavery greatly enjoyed painting the links at North Berwick; this is one of a number of such commissions that he undertook for the Ford family. This painting hung in a gentleman’s club in Glasgow until 1997, when it was sold at Sotheby’s, to an American collector, for nearly £750,000. Born in 1856, Lavery`s beginnings were turbulent. He was four when his father, a Belfast publican and his mother died, so he was brought-up by relations. His first job was as a photographer`s re-toucher in Glasgow, fitting in classes at the Haldane Academy of Art, which became Glasgow School of Art. Always internationally minded, he studied for three years in Paris and had a picture hung in the Salon alongside Manet`s `Bar at the Folies Bergere`. On his return, he was commissioned by a Glasgow corporation to paint the state visit of Queen Victoria and thus he wrote `At one swoop, I was ushered into royal circles`. Lavery wrote that he and his Glasgow contemporaries recognised Whistler as the greatest living artist and thought of his `pen o`clock lecture` as being the gospel of art. Subsequently Lavery and Whistler became friends. Lavery was 90 in 1918 and elected Vice President of the International Society of Sculptors, Painters and Engravers and although based in London, from 1890 he spent most winters at his studio in Tangiers.